In articles like Rick Warren And Teachings Of Demons and Rick Warren On Mentors Like C. Peter Wagner and Rick Warren, Laverne Adams, And Chuck Pierce’s Global Spheres here at Apprising Ministries I’ve discussed some of the many problems with Purpose Driven Pope Rick Warren. Then I began to introduce you to Sam Rodriguez in Rev. 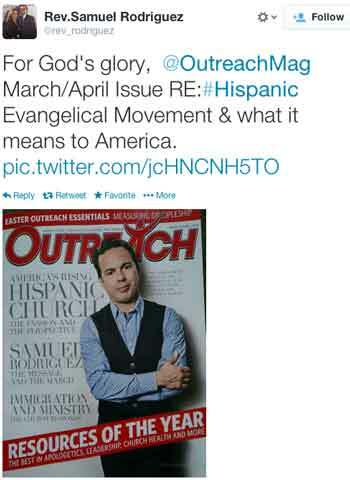 Samuel Rodriguez “Honored To Partner” With Word Faith Preacher T.D. Jakes. As you’ll see, Rodriguez is now set to share the podium with Rick Warren at the Thrive Conference (TC) this coming May 1-3. You may know that Strobel is a well known Christian apologist who was once “a teaching pastor at Willow Creek Community Church”1 and now serves as Professor of Christian Thought at Houston Baptist University while Daly is president of Focus on the Family. Here with BC it appears that we’re getting yet another megachurch a la Rick Warren’s own Saddleback Church. However, it’s important to remember at this point that while “fastest growing churches” do please the eyes of man, this simply does not insure that God is actually behind that growth. Let me be clear in that with conferences like Thrive your pastor is going to learn strategies for numerical growth that come straight out of American secular business practices; methods via apostates like Peter Drucker, which were repackaged with Christian terminology and brought into professing Christendom by Leadership Network. With this in mind, my point with this piece is to further introduce you to Rev. 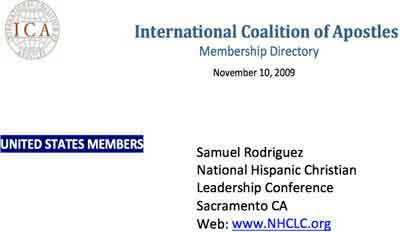 Samuel Rodriguez, who has long operated within New Apostolic Reformation (NAR) dominionist and hyper-charismatic circles. You need to know that over the past year he’s another NAR adherent beginning to rise in popularity within the more mainstream. Pastor Phyllis Towles was licensed for ministry in 1995 and became an ordained evangelist in 2002. Pastor Phyllis has been with New Season CWC since 1999, and was installed to the office of Associate Pastor in 2012 by Rev. Samuel Rodriguez thus fulfilling a prophecy spoken over her in 1999.
discussed how God could use the combined efforts of global apostolic leadership to advance the Kingdom of God more effectively… John P. Kelly was asked to assume leadership as Convening Apostle for the new coalition and to establish an office in Fort Worth, Texas. John Kelly was directed by the Lord to ask C. Peter Wagner to assume the roll of Presiding Apostle. In 2001, ICAL moved into the offices of Global Harvest in Colorado Springs, Colorado. John Kelly continued to serve ICAL as the Ambassadorial Apostle, representing ICAL globally and conducting ICAL Regional Summits throughout the United States. In 2009, on the eve of his 80th birthday, C. Peter Wagner was directed by the Lord to ask John P. Kelly to again assume the roll of Presiding (now Convening) Apostle over ICAL. ICAL was transferred back to Fort Worth, Texas in the spring of 2010. 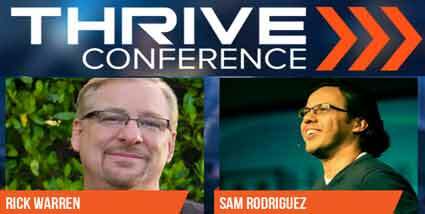 All of this serving as more than good reason to keep an eye on where this Thrive Conference ends up leading Rick Warren and Samuel Rodriguez. There can be no mistaking that Rodriguez is a rising star. also been invited to the Freedom Federation Summit at Liberty University April 15. Speaking earlier at a Rick Joyner’s Oak Initiative gathering at Fort Mill, with great emphasis, Rodriguez rallied the crowd asserting that the Oak Initiative, [NAR “Aosptle” Rick] Joyner’s political action group, is “the New Jerusalem and also Washington DC. This is why e.g. in Francis Chan Declares “I Love Mike Bickle” Of IHOP and Louie Giglio Is No Hero To Be Admired I have been warning you that beginning with his Passion 2012 conference Giglio appears to be marrying his Passion Jesus Generation youth movement to that of Jesus Culture, which already aligns with that of IHOP.